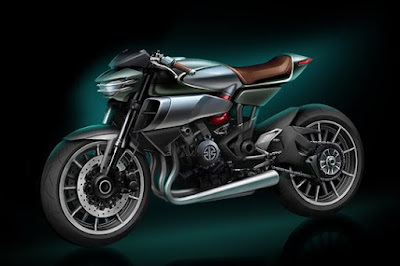 A teaser image of café racer classic motorcycle has recently circulated widely on the Internet. The model is known as the Kawasaki Z900 is expected being developed. Though rumored to be the successor of Kawasaki Z1 were produced in 1972, this classic model of Kawasaki Z900 still has advantages, both technologically and the engine power produced. As quoted of Shifting Gear on Friday, May 13, 2015, although Kawasaki has not yet released the machine will be used and the numbers of power, it can be sure the supercharged device will be installed as an induction device to make an extra engine power. No doubt, the Z900 will have abundant power. The Z900 is a known nameplate from Kawasaki, and this time, the supercharged, 900 cc, in-line 4-cylinder, liquid-cooled motor could redefine middle-weight retro motorcycles. The planned use of supercharged device reinforced with the motorcycle design form. Below the large sized tank lies the airscoops. Futuristic design of Z900 café racer besides thick with a classic feel, also has an aura of modern touches. This model is one of 11 new products to be launched Kawasaki during the next two years. But unfortunately, they did not explain whether the models to be launched. Is the motorcycle concept will meet the same fate as the 'Spirit Charger Concept SC01' (a concept which also reportedly carrying a supercharged engine) becomes just a concept on paper? We'll wait for further news.